 The one-gallon fuel storage container that conveniently folds up when empty. 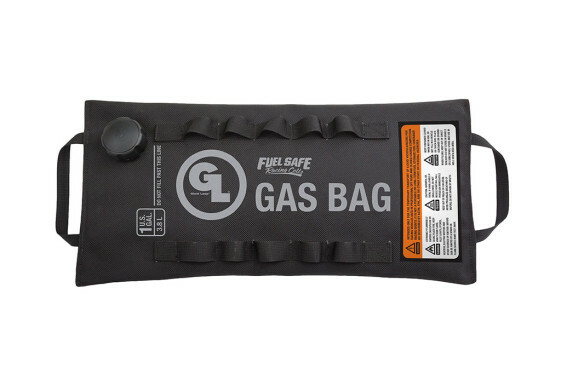 Adventure proof packing systems and gear company Giant Loop’s new Gas Bag Fuel Safe Bladder transports one gallon of fuel and conveniently packs down (unlike solid fuel containers) for space-saving storage when empty. 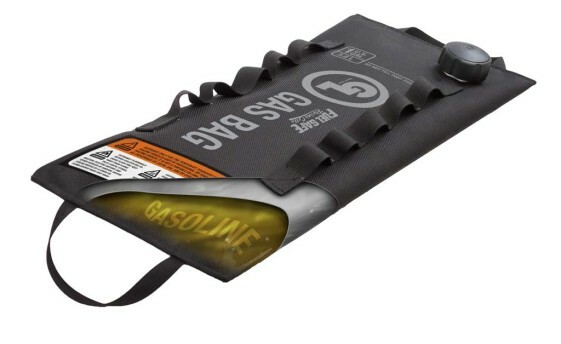 The Gas Bag consists of a collapsible welded film and ballistic nylon reinforced container that is highly durable and weighs less than 12 ounces. Two straps make carrying the Gas Bag easy, while daisy chain loops offer secure attachment points for strapping down the bag during transport. The Gas Bag is designed to permeate very little, so that gas fumes and evaporation are minimized. It offers a convenient way to carry an extra gallon of fuel, to extend your range but the product is not designed for long-term storage of gas. It is recommended that you empty the fuel into your gas tank as soon as you are able to. When not carrying fuel, the Gas Bag rolls up or packs flat so you can easily stash it away in your luggage. The Gas Bag Fuel Safe Bladder was recently awarded the Powersports Business “Nifty 50” for being among the best new products for 2016. Each Gas Bag Fuel Safe Bladder is individually pressure tested and made in the USA by Fuel Safe, a leading racing fuel containment manufacturer based in Redmond, Oregon. • Materials & Construction: Welded film bladder sewn into ballistic nylon sleeve. NOTE: The Gas Bag Fuel Safe Bladder is intended only for the temporary transport of liquid hydrocarbons for racing vehicles used in professional off road and closed course competition racing events. The Gas BagvFuel Safe Bladder is not a portable or long-term fuel storage container as described by ASTM, EPA, ARB or other state or federal agencies. Good idea, but seems like it would be a bit cumbersome to pour out the fuel into a motorcycle fuel tank. Definitely need a funnel at a minimum and maybe a 3rd hand. A collapsible funnel may be a good option. Comes in handy for fuel or oil fill ups on the trail. $99.00?!? Screw that. I’ll just carry gas in a few Brunton fuel bottles that I got on clearance for $5 each. Usually just use an empty quart oil Jug or two for temporary extra capacity on the high lonely…Ya I pack one with 20/50 in it too. Inside bladder from a Starbucks/Peets coffee pitcher works the same. They’ll sell you an empty clean one. Not for that price! $99? So many cheaper options for the long haul. I think what makes this product unique is that it’s collapsible when not in use, has loops for securely strapping it to the outside of your bike and it’s designed to carry fuel and not some other liquid. Do share if you know of other options that can do the same thing cheaper. Soon as I saw this, I knew it’d be expensive. GL’s stuff is always overpriced. I have two of their Fandango tank bags, both of which I bought used for less than half price, and neither have held up well… and they aren’t waterproof either. If I had paid full price for them, I’d be pissed.